Globex Evacuation Chairs | Haven Fire & Safety L.L.C. GLOBEX Evacuation Solutions provide Evacuation Chairs to ensure the safe evacuation of mobility impaired persons up or down stairs when lifts can not be used in the event of an emergency, power failure or during lift maintenance. Their range of products can also be used as transportation chairs for medical purposes and also used for domestic properties. 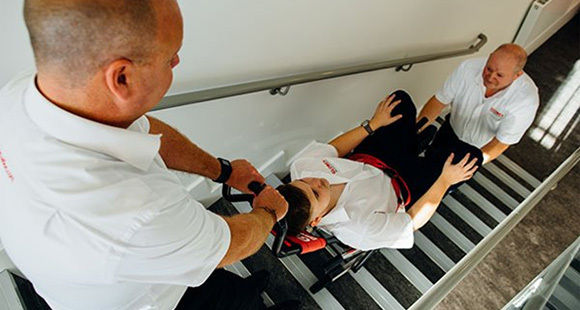 The GLOBEX MULTI Evacuation Chair enables one person to evacuate a physically impaired person safely and easily down stairs and for two people to carry one person upstairs and over obstructions. It is simple to operate, with fixed wheel operation for internal and external use and a unique anti-tip feature and carry facility. The GLOBEX ECONOMY Evacuation Chair provides a solution for evacuating people down stairs only and can also be used as a transportation chair. This model operates in a similar way to other popular manufacturers. In additon to product supply, it is essential there are suitable and sufficient procedures in place, trained operators and that equipment is correctly and regularly maintained. With the support of Haven Fire & Safety in the UAE, Globex Evacuation Solutions provides a complete support service to assist with compliance, including certificated training and maintenance on their own products, ensuring peace of mind for clients and maintaining product warranty.